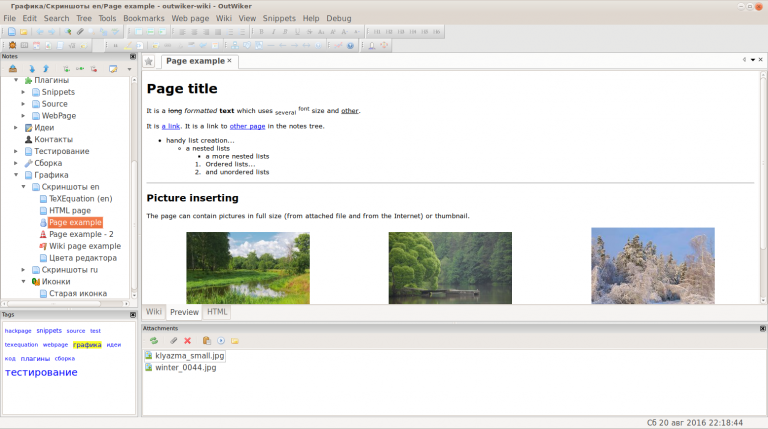 OutWiker is a free personal wiki for organizing text notes into a tree structure. The program uses wiki-type notation and its own commands to set up lists, tables, headings and assorted formatting options, insert images and more. There’s also support for including graphs, diagrams, equations and more. Pages can also have as many attached files as you need. Right-clicking a page gives you options to add sibling or child pages, helping you build your wiki structure. This can be rearranged later by dragging and dropping one section of the tree somewhere else. Unusually, your wiki structure isn’t stored in some custom single file -- it’s built around a standard folder tree. If your top-level page was called Contents, it’ll be stored in a folder called Contents, with the page held in a file called __content.html. That makes complex projects relatively easy to access in other ways. OutWiker doesn’t have a full WYSIWYG editor. It does its work using wiki and other notation. You’re not left entirely alone to figure this out, and for example you can select text and apply standard formatting from a toolbar, or click Insert > Table and choose the number of columns and rows you need. This inserts the relevant commands into the text and you enter your content as usual. If that sounds too complex you could just start with plain text notes. You’ll still benefit from the ability to structure your snippets into a tree, and attach files to individual notes by dragging and dropping. That’s more than enough to be useful, and you can expand your knowledge by learning individual features as you need them. OutWiker is available for Windows 7 and later.